Chicken Tortilla Casserole - Home. Made. Interest. 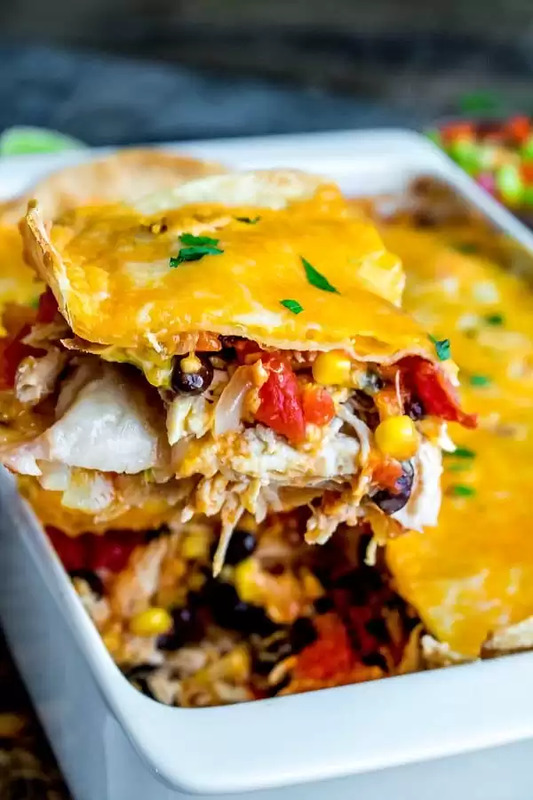 Chicken Tortilla Casserole is an easy Tex-Mex recipe made with layers of flour tortillas and a flavorful filling of chicken, spicy tomatoes, black beans, corn, and cheese. 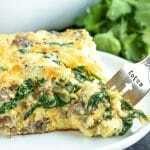 It is an easy dinner casserole that everyone will love. I love Tex-Mex flavors and easy casseroles are a total lifesaver on busy weeknights. 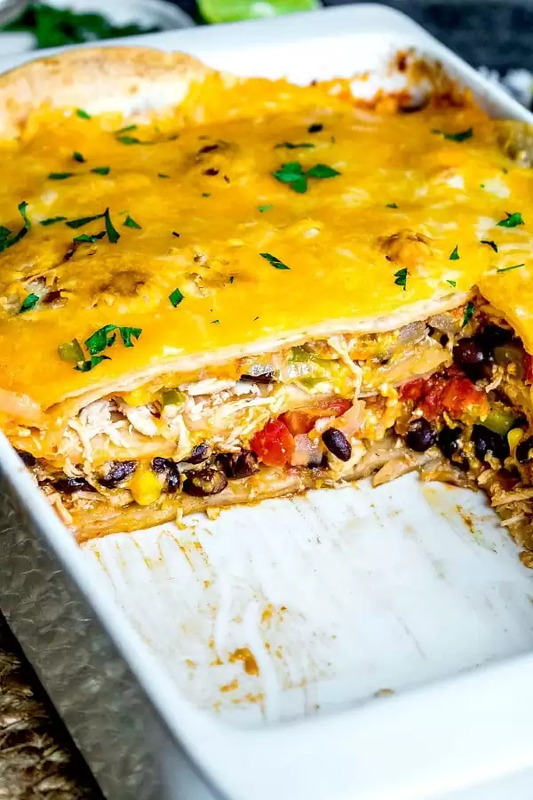 This Chicken Tortilla Casserole is a simple dinner casserole that doesn’t take a lot of effort, especially if you have the chicken cooked ahead of time. My favorite part is the leftovers. I think the sign of a good casserole is being able to enjoy it the next day and this casserole is just as good when it is re-heated as it is when it’s fresh out of the oven. Pack up the leftovers for lunch, or save yourself even more time the next night by serving it again. I promise no one is going to complain. 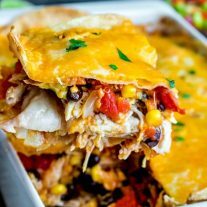 Chicken Tortilla Casserole has everything I love about Tex-Mex layered between thin flour tortillas. 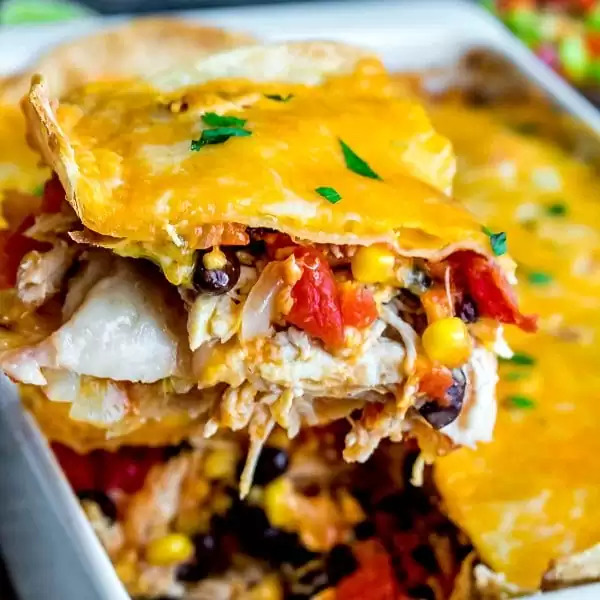 You’ve got your shredded chicken smothered in a flavorful sauce of diced tomatoes and green chilis, black beans, corn, spices, and of course some cheddar cheese, and layers of flour tortillas that make a delicious casserole that is somewhere between a burrito and a southwest lasagna. 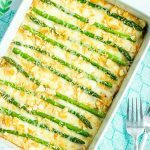 All of those amazing ingredients bake together for about 40 minutes until the cheese on top is all melted and bubbly and the casserole is warmed all the way through. When it is ready take it out of the oven and let it sit for about 10 minutes. I know, it’s hard to resist digging right in, but if you give it a few minutes to cool off it will set up enough to get some nice slices out of it. Serve it up with a little sour cream, maybe a sprinkle of fresh cilantro and dinner is served. Make the chicken ahead of time! Cook a big batch of it over the weekend, shred it, and store it in the freezer until you need it. It saves so much time on weeknights. If you prefer corn tortillas you can substitute them for flour tortillas in this recipe. You will need more tortillas than listed in the recipe because corn tortillas are smaller. Customize this recipe with your favorite Tex-Mex toppings. If you don’t like black beans skip them. If you want a little more heat add some diced jalapenos. It’s all about the flavors your family loves! 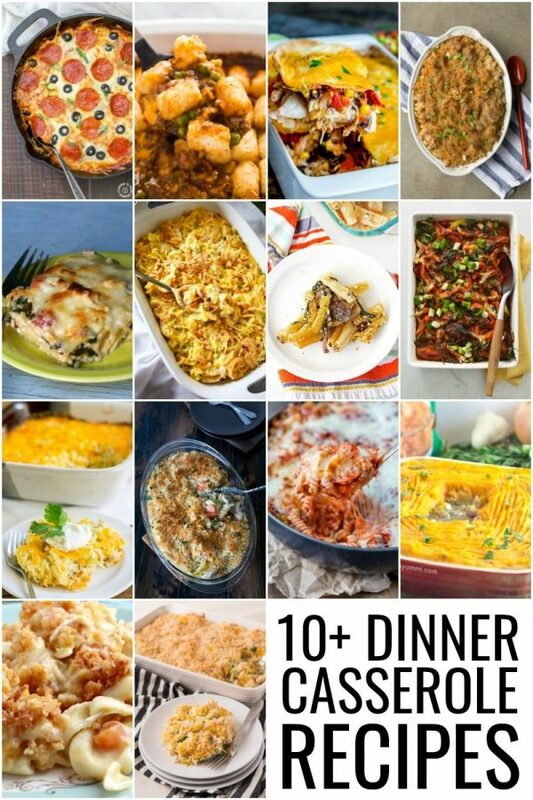 You can never have enough dinner casserole recipes so I’ve gathered some more amazing casserole recipes from some of my favorite bloggers. Take a look and make your grocery list. Dinner is taken care of this week. Preheat the oven to 375 degrees F. Grease a 9×13-inch casserole dish. Heat the olive oil in skillet over medium high heat and add onion, sauteing until softened. Add chili powder, cumin, garlic powder, salt, black beans, corn, Rotel, tomato sauce, and chicken broth. Simmer for 10-12 minutes. Scoop out some of the sauce and spread a bit on the bottom of a casserole dish and then line the bottom with tortillas (about 6). Spread a layer of the chicken over the tortillas then top with a layer of the sauce and a layer of cheese. Top with 6 more tortillas and repeat the layers adding chicken, sauce, and cheese. Top with the last of the tortillas and a layer of cheese. Cover with foil and place in oven and bake at 375 degrees F. for 30 minutes. Remove foil and continue to bake for 10 minutes, until cheese is melted and bubbling. Let rest for 10 minutes and serve. YUM! Mexican food for the win. Love the combo. This would definitely be a hit at my house! This casserole looks SO good!! Plus, I love recipes like this that use ingredients I always have on hand. This is my kind of meal! Perfect for weeknights! I love Mexican food too, especially during the week. 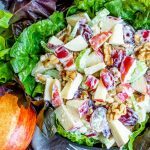 It’s always jam packed with flavor and easy to put together! This casserole looks just perfect. This looks delicious and I appreciate the roundup–but WOAH, how the heck did you get such a clean cut? Whenever I do a casserole recipe I feel like it looks like mush in every single picture, haha. 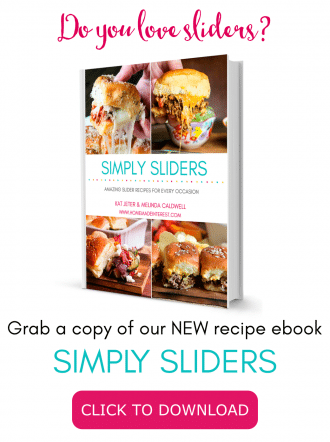 Such a yummy, easy recipe! Definitely something our whole family would enjoy, even the 3 yo, surprisingly and we always have shredded chicken on hand from our IP! Tex Mex Cuisine is my go-to when I need something extra comforting and warming! This casserole looks so soul-hugging delicious! A winner for sure! I know I wouldn’t complain. This looks like an awesome dinner that I would scarf down. And if anybody SHOULD complain, I hope they are cooking tomorrow and it better be wonderful. We love mexican themed dinners at my house so I already know my family will love this. Looks really delicious. Full of flavors and so easy to make. Perfect! I love black beans anything – so nutritious! This sounds like a complete meal on it’s own. I love such dishes. Saving for later. Love the spices in this casserole. Yumm! Plus all-in-one easy dinner promise is best in my books for weekday. Makes life so easy and saves so much time and dishes. 🙂 Thanks for sharing a delicious idea. That sounds excellent. Now that I”m cooking for the parents as well, I make casseroles more than I ever did, so your collection of recipes is appreciated! And I know they’ll love the chicken. We love Mexican food. This is definitely going to be a super hit in my house. Looks amazingly delicious. I am all about casseroles and tex-mex and tex-mex casseroles! I’ll definitely have to add this to my menu for dinners this week! Made this tonight, it was awesome—I ended up using colby jack cheese (worked great) and used about a half cup more cheese than it called for. I also used corn tortillas instead of flour, and those were great too. Otherwise, I stuck to the recipe and it was excellent, hearty and a little sweet, and not too spicy for my picky kids. Thanks! All awesome substitutions. It sounds delicious. So glad the whole family liked it!